With so many great communities in NYC, it’s a pleasure to work with a diversity of partners who create their own Green Maps. We welcome more schools and groups that would like to get involved, too! 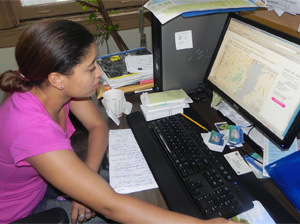 In 2012, fresh new Green Maps are being created in Soundview Park in The Bronx, Kaiser Calvert Vaux Park in Queens and East River Park in Manhattan. Each park has new resources and local youth are involved, helping promote them using the Open Green Map. A new map of bike tours designed by different community groups that connect the neighborhood and East River Park may be co-created next! As part of their experience with Velo-City, a cycling-oriented planning and urban design education organization, youth cyclists have created a Green Map of the East River Park during its redevelopment. Velo-City is one of our partners in the Local Spokes coalition. Youth charted Newtown Creek, one of our most polluted waterways in 2003 with the East River Apprenticeshop, a program that taught boat building, seamanship and communications. This Green Map has been a popular download ever since. The Creek, which separates Brooklyn and Queens at the East River, is slowly being restored to a healthy waterway. Two Green Maps were created at Recycle-A-Bicycle’s Inwood shop in upper Manhattan in 2003 and 2004, on local food - Sprout to Action - and on air pollution and asthma - Space to Breath. Both are bilingual, in Spanish and English. We especially appreciate how this map is composed, incorporating tree cover and asthma maps into the youth perspective on a health issue that impacts nearly every family in the area. Getting around without motor vehicles is the theme of this map. It charts car-free mobility options, as well as impediments to safe cycling. The youth invented the awesome ‘Demand Man’ and explored Brooklyn, Manhattan and Staten Island during the mapmaking process in 2002. This 4 week summer project resulted is a great little map questioning the lack of public access to the East River waterfront in Brooklyn. Published in 2001, this map was a poignant part of the campaign involving the Metropolitan Waterfront Alliance and neighborhood organizations. Today there are great new parks all along this map’s route, as well as the Brooklyn Greenway-in-development. This Year 2000 project took on an important topic, waste. As part of the process, RAB youth charted the city's Garbage Crisis and proposed transfer stations that would impact low-income communities along the waterfront. This map became part of the campaign that successfully stopped the poorly planned waste transfer stations and the estimated 5000 truck trips per day they’d bring. However, New Yorkers are still inept when it comes to waste reduction and recycling, with less than 20% of our enormous waste stream making it into the right bin. This is one of the very first youth-made Green Maps in the world!! Educator Roy Arezzo and middle school students worked to create a bicycle tour and presentations to the Community Board to celebrate and protect Greenpoint-Williamsburg's community gardens. Published in 1999, this map is one of the reasons our global program at GreenMap.org/youth exists!